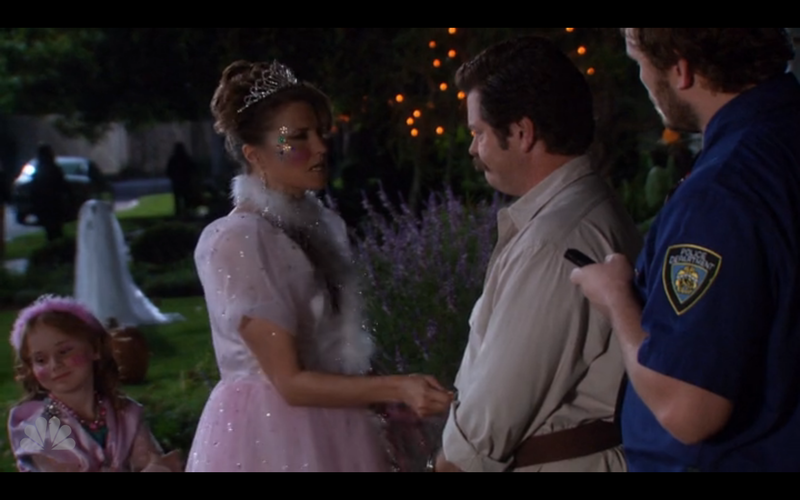 Halloween in Pawnee: a time to dress like a princess, face your fears, live-tweet 26-year-old horror movies, and get yelled at for not including spoiler alerts when you live-tweet 26-year-old horror movies. It’s also a time make the sacrifices you have to make in order to hold on to what matters most. Life gets messy sometimes, but you can’t make an omelet without breaking a few tiaras. Everyone says that Halloween is the time to be the person you’re not. On Parks and Rec, it’s the time to be exactly the person you are. It’s like they’re all walking around every day in their Clark Kent glasses, and they finally get to reveal their true superpowers. Leslie Knope IS Rosie the Riveter—a tireless, empowering, optimistic example for women everywhere. Rosie’s also just a really good look on A-Poehls, yes? Ann Perkins is a graceful powerhouse who deserves her own time in the spotlight. Ron is both a pirate and a traditionalist. Diane is straight-up royalty. Andy is a policeman in the making. They’re all wearing themselves on their sleeves. In Chris’s case, that takes a little coaching. His therapist, whom I already love dearly, pity slightly, and hope to see onscreen, suggests that he dress as the thing he fears most, aka an old paunchy man. Old adorable paunchy man. This is how I like Chris’s existential crises: acknowledged and dealt with but not overwhelming. We still get hyper-positive Traeger, but he’s got more depth now. As they all gather to watch Death Canoe 4 on the big screen, Chris faces down one fear (horror movies) and wears the face of another. Donna is more than willing to comfort him; she reminds him that he’s not alone and scores some quality hug time from her boy. Not everyone gets body-to-body contact so easily. Ron finds himself in a pickle with Diane, who invites him to go trick-or-treating. Last year he was fixing pipes and giving a Lowe’s employee the verbal smackdown. This year he has people who want to trick-or-treat with him. I’m so invested in Ron and Diane that it’s actually frightening, and I have been since their first scene together. They’ve got buckets of chemistry. We don’t know much about Diane, but she’s pretty much definitely Ron’s soulmate. And it’s awful, because Lucy Lawless has enough going on as an actress that I have a hard time believing she’ll get to stay forever. But I, like, need her to stay forever. Diane has this strength about her. She’s confident and straightforward. I like the contrast between her coolness and her kids’ manic energy; she lives in their world without being defined by them. She thinks princesses are a “nightmare” but loves her daughters enough to dress up anyway, and somehow the sparkle only makes her more of a badass. Mid-trick-or-treat, Diane is called away on a Vice Principal emergency because “some idiot kids were caught pooping on the soccer field.” PIKITIS. In her absence, Ron and Andy are stuck with the girls, who have normal kid problems like the need to go to the bathroom at the most inconvenient times. Also, the need to match. When Zoe accidentally breaks Ivy’s tiara, Ron breaks Zoe’s to even the score. Now he has all the fairness and all the tears. 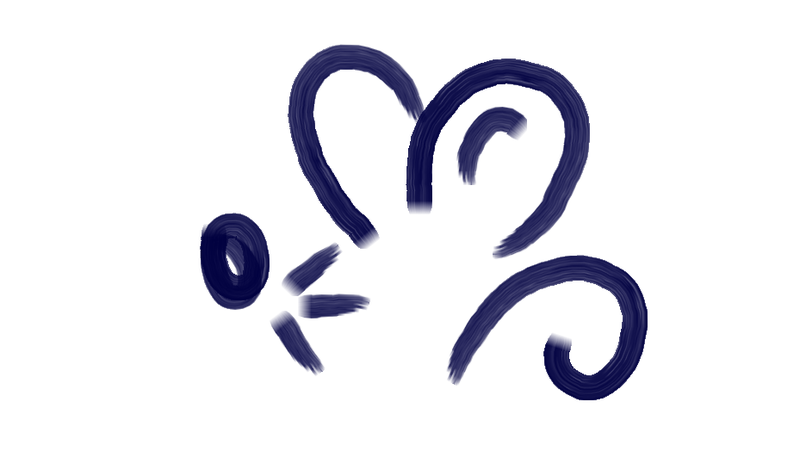 As for Leslie, she’s feeling pretty teary herself. The day started out wonderfully enough—Ben’s set to come home in just ten days, and then they’re moving in together! I’ve always wanted to see more of Ben’s life with Andy and April, eating turkey chili out of frisbees as Ben slowly loses his faith in humanity, but I think a Knope-Wyatt household is an even more exciting alternative. It starts with buying a new house, because Leslie’s place “is a scary, nightmare hoarder nest. His words. And Ann’s. And the official report filed by the health department.” I love that her house is a mess, that she’s not perfect, that her compulsive passions all collect and collide in her home. I wonder how she and Ben will organize it all. They’ve found an ideal candidate—though, like all houses in the world, it lacks a trampoline room. Can we all agree that this is what’s wrong with all houses in the world? It does, however, have an Oprah Suite. Leslie decides to take it, and Ann’s ready with the dance party. This is why they’re friends. Ann knows that Leslie needs the important moments in life to feel important. If they’re not big, she makes them big. Over in DC, Ben’s having a big moment of his own. His candidate has an 18-point lead, so this election’s in the bag. I guess this means we won’t meet robo-candidate again. So many bittersweet goodbyes tonight! April’s not feeling particularly sappy, though. When Ben dismisses her, she runs off, presumably to straddle Andy inappropriately in another public arena. I’ve loved her special times with Ben. I hope we’re not saying goodbye to their awkward friendship, too. At least her return to Pawnee means the return of April and Ron. She’s eager to “meet Ron’s lover,” and when she learns that Diane isn’t happy about the tiara incident, it’s April of all people who advocates just saying sorry. It takes him a while, but Ron eventually tucks away his pride and knocks on Diane’s door. “Hello Diane. I have brought you flowers. Also chocolates. 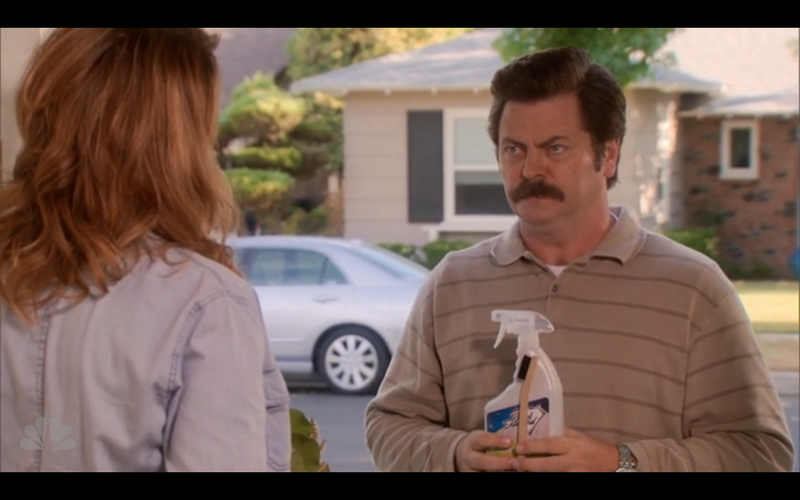 And some grout cleaner…I noticed you needed grout cleaner, so I brought that too.” This is Ron Swanson in love. He’s just a man standing in front of a woman, holding some grout cleaner and asking her to love him. Diane reminds Ron that her kids are part of the package, and Ron takes a huge leap by admitting that he wants everything in that package. He wants to get to know her kids. Spoiler alert: bringing a saw is not the proper way to do that. To his credit, Ron reaches that same conclusion right away. He actually giggles at how silly he is. Ron Swanson is becoming self aware. To make up for Halloween, Ron takes the kids for a trick-or-treating do-over. November 8th or not, these girls are getting their treats! He persuades people to give away their cookie dough and even calls the girls “adorable”—which, at this moment, they totally are. And so is he. Next page: So much stuff is happening right now! This was the perfect recap! I loved everything you said about Ron and Diane because I am crazily invested in them (and just Diane on her own) already too. She has such a quiet strength, and I love how much she clearly loves her daughters while still maintaing her own identity beyond being just a mom, too. And I will certainly join in your angry letter-writing campaign if Amy Poehler doesn’t win an Emmy next year. She is beyond flawless at this point. Right?! I can’t stop thinking about that episode where Ron wins the Female Empowerment Award and everyone gets into a discussion of how pointless awards are, “but they’d be less pointless if they went to the right people.” YES. And Diane is straight-up never allowed to leave this show. I have to confess I had only watched this show once or twice before Lucy Lawless came on the scene. It actually is a very good show. And, being a huge Lucy fan, I ,too, hope she becomes a permanent fixture. Of course, the fact that she was cast as a “Princess” conjured up images of a Princess of a different persuasion to this die-hard Xenite; one of the “Warrior” variety involving leathers, swords, and chakrams instead of sparkles, boas, and tiaras. 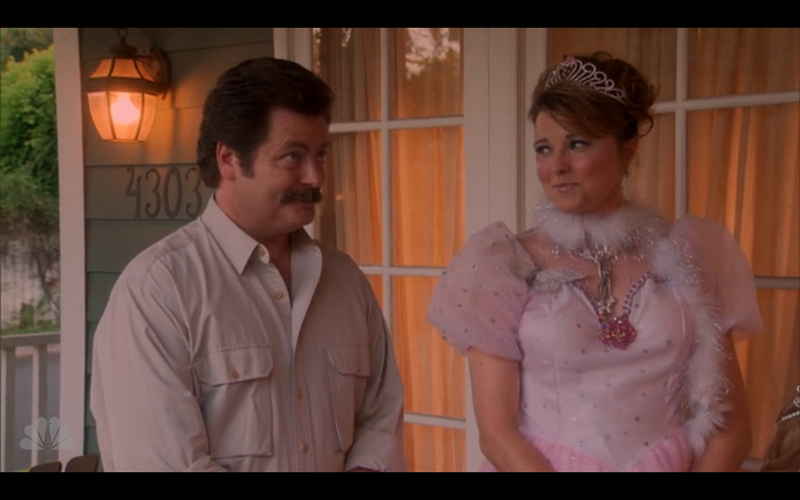 But the pink and fluff fit Diane perfectly; and so does Motherhood and Ron Swanson!